You most likely know the feeling of knowing a song so well that you can mark a break with your hand while listening to it, or shout a line in the lyrics in perfect harmony with the record, or even play the drums break on your air-drum set. It is a thrill. Now picture yourself hearing that same song that you know so well, but at a live performance, and as you prepare to tag along and duplicate, spit out what the record has implanted in your mind, the musician surprises the crowd with a twist. Now that is a thrill. A question was raised in my mind when listening to very different records that I enjoy a lot in completely different ways, but always in a way related to a form of anticipation of the music I am hearing. How does my mind enjoy when music meets my anticipations and when it doesn’t as well? My complete inability to anticipate Monk’s jumps and stunts throughout the record, although being familiar with his type of playing in general and having also heard that specific record before, made me reflect on how anticipation in music, when it is not met and is disturbed by surprising effects, generates great result and beautiful music. That said, I am far from being familiar with the music theory and the technical aspect of the music behind it all, which may bring further explanations to this question. But I am writing from any given listener’s perspective, who may, just as well as the educated listener, find himself highly entertained and charmed by Monk’s language, bouncing around the keys, playing with silences, leaving you hanging to stab you with a strong chord at the least expected time. The question gained in depth when I switched to a James Brown record. Just as thrilling, in my humble opinion, but in the complete opposite way. The riff you hear in the first seconds of the song is the riff you will hear in the last seconds. The beat is steady and tunes are all rhythmically linear. But again, it works. Here, I was easily able to anticipate the direction in which each song was going, you can hear the break coming, you can snap your fingers, tap your foot, clap, or even shout the recurrent “HIT ME!” when it comes around… Try to do that to Monk playing alone. 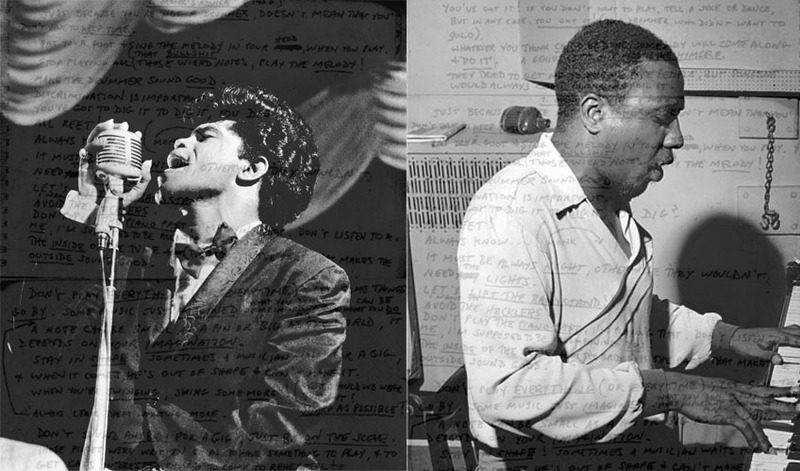 The example of Monk is just one out of a million, as the nature of jazz music throughout the years have always been to surprise the listener, to push the limits and break the rules. Thelonious Monk does have a way of making this surprise effect of music very efficient and enjoyable, but he is far from being the only one. I personally tend to base my personal judgment, if that is worth anything, of a jazz player on his ability to surprise me or break my expectations, while still remaining in the frame of a tune (Free jazz is also something, but I am not familiar enough with it to actually discuss it.) For the example of James Brown, the steady and predictable as a thrilling form of music is found often in popular music, but I do not know of many artists who have the magic that allow James Brown’s tunes to be so conservative and incredibly efficient at the same time. A question to ponder for a minute, but let it not keep your mind too busy to enjoy the music, James Brown would rather see you get up and dance to his music than to see you sit there philosophizing on the nature of his funkyness. Monk probably wouldn’t care much at all. Make sure you check out my music blog for more Monk and other jazzy tunes!